Ideal Tax Solution, LLC is notifying taxpayers about a new free mobile app just released by the IRS. IRS2Go 3.0 version is an update to the agency’s current smartphone application that for the first time provides taxpayers practical tax information in Spanish or English. Anytime we can pass along helpful information to taxpayers we do so energetically. Ideal Tax Solution, LLC has learned the new app offers taxpayers safe and secure ways to access popular tax tools and up-to-date tax information. A taxpayer’s phone language setting can now determine if Spanish or English content will appear. Apple users can update or download the free IRS2Go application by simply visiting the Apple App store. Android users can visit Google Play to download their version. Either way, IRS information is now available to taxpayers at the touch of their cell phone keypad. Ideal Tax Solution is actively alerting Spanish speaking taxpayers and clients of this new easy-to-use 21st century IRS tool. the mobile app with a few basic pieces of information. ∙ Get Tax Record. Taxpayers can now order their tax account or tax return transcript from a mobile device. ∙ Watch the IRS. App users can view the IRS YouTube videos on their smartphone. ∙ Follow the IRS. People can sign up to follow the IRS Twitter newsfeeds. ∙ Get Tax Updates. Phone app users can enter their email address to automatically get simple, straightforward tips and reminders to help with tax planning and preparation. ∙ Get the Latest News. With this tool users can quickly access the latest updates on the IRS.gov English and Spanish news pages. 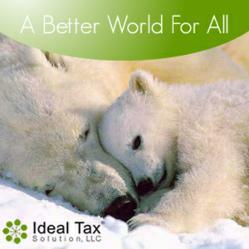 For more information on IRS2Go, contact Ideal Tax Solution or visit http://www.IRS.gov.